Immediately after noticing what looked like a candy in her friends’ mouth, the teacher came up to her, and slapped her face. “Spit it out,” the teacher said. “I can’t,” Jeong’s friend replied. The teacher hit her once again. “No one should have any food while studying in class. What kind of a student are you? Spit it out,” he said. Jeong’s friend paused for a second. She remembers seeing an almost mischievous glint in her friend’s eyes. “Mr. Kim, I literally can’t,” Jeong’s friend said, and then almost proudly stuck her pierced tongue out. “My teacher looked terrified -- I think he had never seen a tongue ring before,” Jeong said. “He then walked out of the class and didn’t come back for a while. I remember my friend laughing. I think it was her way to rebel. We were slapped for not wearing our uniform properly -- even for having forgotten to wear a vest even if it was not too cold --, we were slapped for wearing an earring, and we were slapped for eating candies in our class. But teachers certainly weren’t prepared to deal with pierced tongues. Some 15 years have passed since Jeong’s high school years, and South Korea is now facing a public debate on school uniforms, especially the ones for young girls. In July, President Moon Jae-in ordered his staff to change the current uniform design -- similar to that of the European style naval uniforms typically consisting of a white shirt, plaid skirts and tight blazers -- to something more practical and comfortable, with items such as sweatshirts, hoodies and shorts for both boys and girls. Behind the change is a new wave of teen feminism in South Korea, which has also been a driving force behind the MeToo movement at schools against teachers and fellow students. The teen feminists, many of whom were born when Jeong was a teenager in the early 2000s, have been actively participating in the so-called “free-corset” campaign, rejecting to wear make-up and protesting against lookism at school, filing complaints to the government calling for new, different uniforms. For them, many commercial ads that promote school uniforms are problematic, as much as the oppressive school system that currently punishes them for uniform-related “misconducts,” such as wearing sweatpants even after the gym class is over, or girls wearing a blue tie instead of a red one, because blue is “not a suitable color for girls.” Often featuring slender-figured K-pop stars as models, the ads often show images of young women wearing short uniform skirts and tight, body-conscious blazers, they say. 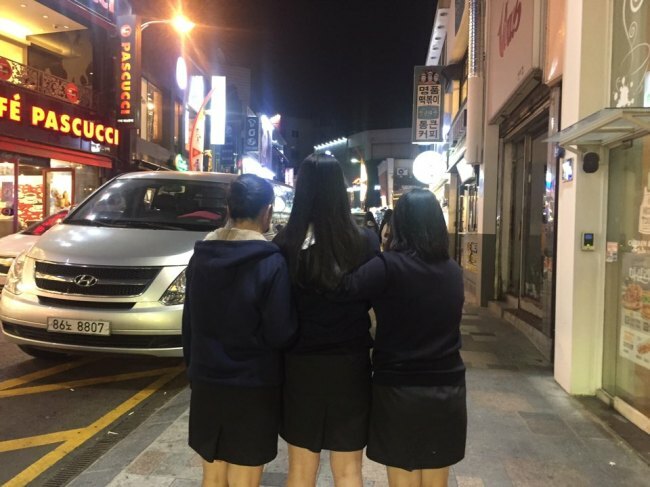 “At school, we are constantly told that we should ‘look like’ students, by never wearing make-up and earrings, not even just a lipstick, and wear our uniforms properly,” said Yoo Jin-ah, a 16-year-old high school student in Seoul Capital Area, who has recently filed her concerns over uniforms to the government. “What bothered me so much was that none of my teachers would say, ‘you don’t have to wear make-up if you don’t want to, because no woman should be pressured to look a certain way,’” Yoo told The Korea Herald. Kang Min-jin, a youth rights activist, said Korean teenage girls are often oppressed in two different ways. “There’s this image that is expected from the school authority figures and their parents: diligent, sexually ‘innocent’ and hard working,” she told The Korea Herald. 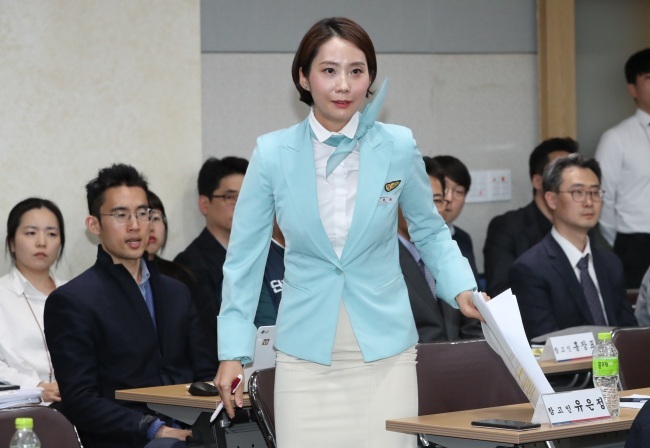 Earlier this month, Yoo Eun-jeong, a Korean Air flight attendant, testified at the parliamentary audit of the Ministry of Labor wearing a uniform consisting of a tight ivory skirt, a white blouse and a sky-blue blazer. “I’m here to say our uniform -- too tight and too light in color -- is not suitable for the work that we do, which involves dealing with food and drinks on flights, and assisting our passengers with their luggage,” Yoo, 43, told legislators. Yoo said the uniform sexualizes Korean Air’s women employees and makes them vulnerable to sexual harassment and even spycam crimes. According to Rep. Lee Sang-don of the minor Bareunmirae Party, there are many sexually explicit pictures of flight attendants in their uniforms circulating online, many of which have been taken secretly by passengers. Yoo’s account, some experts and students say, shares striking similarities with the experiences of high school students. Kang Eun-ji, a high school student, said many of her friends had experienced digestive problems because of the tight uniforms. In July, then Gender Minister Chung Hyun-back met with a number of high school girls and teachers to discuss the school uniform issue. A student at the meeting recounted how she tried to get a uniform blouse that was a size bigger. “I told the salesperson that the ‘right-size’ blouse was too tight on me and I was very uncomfortable in it,” the student said. Choi Yun-jeong, a senior researcher at the Korean Women’s Development Institute, said uniforms in Korea often exploit women, by forcing gender norms and limiting their mobility. “We really have to think critically about whether it is ideal to force girls to swear skirts all the time,” Choi told The Korea Herald, adding that what is being experienced by female flight attendants is just an "adult version" of what's happening to high school girls with their uniforms. And uniforms are often linked to body shaming and even bullying in classrooms. A high school teacher, who was also present at the event with the ex-minister Chung, said she witnessed many school boys who make sexually explicit jokes about their female classmates’ appearance and their physical attractiveness -- or unattractiveness -- , especially the way they look in their school uniforms. Some boys would “evaluate” and “label” their female classmates according to their appearance, giving an A+ to the prettiest girl in the class, and giving an F to the “least attractive classmate,” the teacher added. In middle school, Yoo envisioned forming a feminist study group once she started high school. The dream, however, failed to materialize as teachers were against the idea. Still, for Kim Yoon-seo, a classmate of Yoo and Kang, feminism has helped her with her self-esteem and her sense of self-worth. It also drove her to support the “corset-free” movement, while also calling for a new uniform that does not reinforce gender stereotypes. Before discovering feminism through social media and her friends, Kim said she had been obsessed with makeup. “I would never show my face to anyone without makeup. I would not leave the house without it,” she said.